Editor's note: In this Memorial Day tribute to veterans, a local Army airman recounts his World War II experience. Fewer than 2 million of the 16 million veterans who fought in that war are alive today, according to The National World War II Museum in New Orleans. Leaping from an exploding plane 66 years ago, World War II veteran Harold Stock plunged into nearly a year of hell and captivity by the Nazis, an ordeal that revealed both the horrors of war and the unexpected humanity of his captors. Stock, 88, of San Marcos, was the 22-year-old co-pilot of a B-17 Flying Fortress charged with bombing a German oil refinery on Sept. 13, 1944. After his plane was damaged mid-air over the target, Stock and his crew bailed out over Nazi territory, where he was captured and held for 11 months as a prisoner of war. "I didn't mind the flying," he said last week. "But I didn't like being a prisoner of war." Stock had enlisted two years earlier as an Army airman and been assigned to serve as co-pilot, a post he described as both challenging and exasperating. "When you know what the job of a co-pilot is, you can feel sorry for the jackass," he said in referring to the pressures and responsibilities of the job. "He has to know everything on that aircraft and take over any position." Stock's mission that day was to drop bombs on a German oil refinery in the Blechhammer industrial complex, a high-priority target in a campaign to stop Hitler by destroying his fuel sources. "What they wanted to do more than anything else was to keep their tanks from rolling, their trucks from rolling and their airplanes from flying," said Jeff Underwood, a historian with the National Museum of the U.S. Air Force at Wright-Patterson Air Force Base in Ohio. The refineries were hard to destroy because of their heavyweight equipment, so military leaders approved plans for 59 continuous air strikes on four of the largest plants to knock them out of production, helping starve Nazi oil supplies and end the war, Underwood said. "What stopped Hitler is that he lost all his oil," Stock said. "He lost his oil because we bombed the heck out of it." The Sept. 13 raid was one such mission. After several hours in flight, Stock's bomber reached its destination and the bombardier shouted the order to release the bombs. Before he could shout "bombs clear," though, the ordnance struck another B-17 in the same formation that had veered beneath them, triggering an explosion that incinerated the aircraft and blasted Stock's Flying Fortress, according to Boguslaw Zieba, the author of "Blechhammer," a historical book about the mission. Underwood said that based on some accounts, however, there's some doubt whether the Flying Fortress was struck by an explosion from its own ordnance or by enemy fire. "That's the chaos of combat," he said. What's certain is that the strike wrecked the bomber. "A huge explosion rattled the aircraft, fire swept through the fuselage for a while and splinters caused significant damage on board," Zieba wrote. "The plane immediately lost altitude and was dropping." The pilot ordered his crew to bail out, but as Stock prepared to jump, he noticed that the tail gunner was missing. He found him cringing in the tail compartment. "He was really petrified," Stock said. "He was a little guy, so I got a lock on him, put a parachute on him and hauled him into the bomb bay. He thanked me when we were on the ground for saving his life." As the crew floated down to earth, the burning plane circled around them on autopilot, veering near their parachutes. "I thought we were going to get hit, and then it blew up," Stock said. "We landed together in this big open field, full of German soldiers fighting over our parachutes. You know why they were fighting? They had wives at home and wanted to take the silk home for ladies' underwear." Most of the airmen found their way to friendly farmers or resistance fighters, but Stock was captured by German soldiers. He said one of his captors demanded to know if he spoke German, then butted him with his rifle when he answered no. Just when he thought he was going to be shot, he said, the soldier confided to him in English that he studied at the University of Southern California and had been conscripted on his return home to Germany. "I asked him how he liked Germany after I found out he had gone to college in L.A.," Stock said. "He said, 'Not as well as I used to.'" Stock was transferred to one of the largest prisoner of war camps, Stalag Luft I in Barth, where the lives of 9,000 captured Allied airmen rested precariously on the whims of their captors. One day, a one-armed German colonel, a veteran of World War I, was ordered to line up and shoot a number of prisoners, including Stock. "He refused," Stock said. "A Hitler Youth shot him in the head. Then a real old German sergeant killed the kid. ... He said, 'I'm really saving all your lives.'" Such glimmers of conscience weren't uncommon in prisoner-of-war camps, which were run by German airmen, the Luftwaffe, who respected their American counterparts and held to reciprocal rules of combat, Underwood said. "They were good people, most of them," Stock said. On one occasion, though, Stock said he was walking out of a camp barrack when he noticed a German sniper lying prone outside, aiming a rifle at the door. As Stock rushed back to warn the men in his room, another soldier stepped outside and was killed. "I could have prevented that," Stock lamented. "I should have stayed by the door. In a way, it's kind of a guilty feeling; stupidity." When the war ended and a flight school classmate came to fly him out of Germany, Stock learned that his wife, Dorothy, who was six months pregnant with their first child when he left for war, had given birth to a son. During liberation festivities in France, Stock recalled watching a motorcade of American brass. He said Gen. Dwight D. Eisenhower "jumped out of the car, put his hand on my shoulder, shook my hand and said, 'I wanted to congratulate you. You bombed the oil refineries and ended the war.'" Stock returned home and landed a job at a surveyor's office, where he said his rapid rise from new hire to supervisor sparked office gossip. "I kept wondering why they kept calling me the fair-haired boy," he said. Later, he saw a picture of his boss' son, who had also served in the war and been killed on his first combat flight. "He looked exactly like me," Stock remembered. Stock, who raised six children with his wife, said that although he's probably "the luckiest guy alive," his war memories still haunt him. Harold Stock, a San Marcos resident who was a prisoner of war during World War II, died Nov. 18. He was 89. 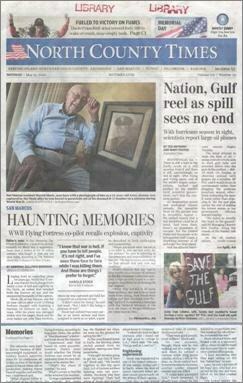 The North County Times profiled Stock in a May 2010 story that recalled his ordeal as an Army airman whose B-17 Flying Fortress crashed during a bombing run on a German oil refinery. Author Boguslaw Zieba also recounted the story in "Blechhammer," a historical book about the mission. Stock, the 22-year-old co-pilot of the plane, was on a mission to drop bombs on a refinery in the Blechhammer industrial complex, a high-priority target in a campaign to stop Hitler by destroying his fuel sources. While releasing its bombs, the plane was struck by an explosion. The crew bailed out over Nazi territory, and Stock was captured and held for 11 months as a prisoner of war. He had numerous brushes with death after the crash, and in several cases received unexpected help from his adversaries. During his capture, Stock said, he was nearly shot before discovering that one of the German soldiers who held him spoke English ---- and had attended his own alma mater, the University of Southern California. Stock was transferred to one of the largest POW camps, Stalag Luft I in Barth, where the lives of 9,000 Allied airmen rested on the whims of their captors. "He refused," Stock said in the 2010 interview. "A Hitler Youth shot him in the head. Then a real old German sergeant killed the kid. ... He said, 'I'm really saving all your lives.'" After the war ended, Stock said he joined liberation festivities in France. As a motorcade of American brass passed him, he said Gen. Dwight D. Eisenhower jumped out of a car to congratulate him. Stock returned home to California, where he raised a family with his wife, Dorothy. His son Steven Stock said his father rarely talked about the war until he began attending meetings with other POWs in his later years. "He was always glad to do his part, and when he started going to the POW meetings, he realized that there were a lot of guys that had it way worse," Steven Stock said. "He just felt real fortunate to have made it through. And so do all of his kids, because we wouldn't be here otherwise." After his wife died earlier this year, his son said, Harold Stock broke his hip and suffered complications from the injury. He is survived by five children, along with his grandchildren and great-grandchildren.